Larne War Memorial pictured on Monday, December 18. 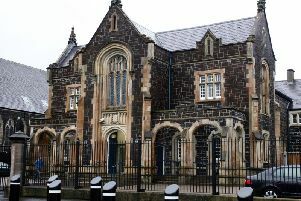 Work to clean Larne Cenotaph after a paint attack earlier this month is nearing completion, Mid and East Antrim Borough Council has said. The war memorial was targeted by vandals overnight between Wednesday, December 6 and Thursday, December 7. Repairs to the bronze plate. White paint was splashed across the memorial causing damage to the stone, bronze plate, railings, and surrounding flagstones. The incident came only a month after a significant refurbishment on the monument near St Cedma’s Church. It is understood a specialist contractor was tasked with the removal of the paint over the past fortnight. The cenotaph was fenced off during the cleaning operation. Some paint remains on the flagstones. A council spokesperson indicated that re-painting of the railings was due to take place today (Tuesday), weather permitting. “Cleaning of the surrounding flagstones will then take place by council after the contractor finishes up,” the spokesperson added.